Chemical Engineering Reference from C.H.I.P.S. This book demonstrates the crossover between chemical and environmental engineering, as well as the integration of engineering with current regulations and environmental media. This title offers over 500 practical solutions to environmental problems that involve chemical engineering. Each problem contains a title, problem statement, data and solution, with more difficult problems located near the end of each problem set. 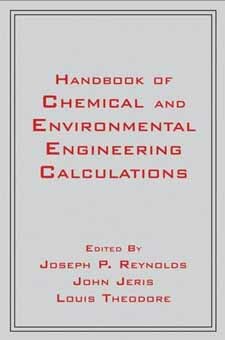 Handbook of Chemical and Environmental Engineering Calculations is a must have comprehensive reference for all plant and environmental engineers and particularly for all those who work with air, drinking water, wastewater, hazardous materials, and solid waste.